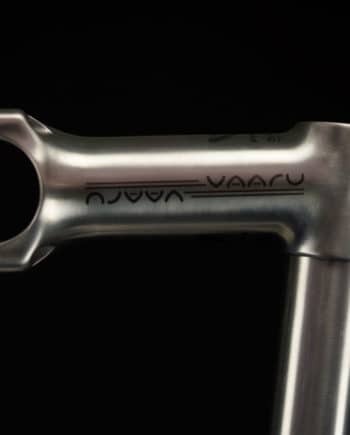 The Vaaru 650 Switch is a titanium 650b hardtail mountain bike frame designed for enjoying singletrack trails, whippy riding, parks and all out fun! Featuring a tapered headtube, double butted 3Al/2.5V oversized tubing, curved seatstays, chainstays and brake mount bridges it’s a handcrafted masterpiece. The dropouts are forged and post machined 142mm with a bolt through axle. The frame has been designed for forks between 100mm minimum and 140mm maximum travel. The top tube is optimized for using an inline seatpost (which most dropper posts are) and a stem between 50 and 90mm. 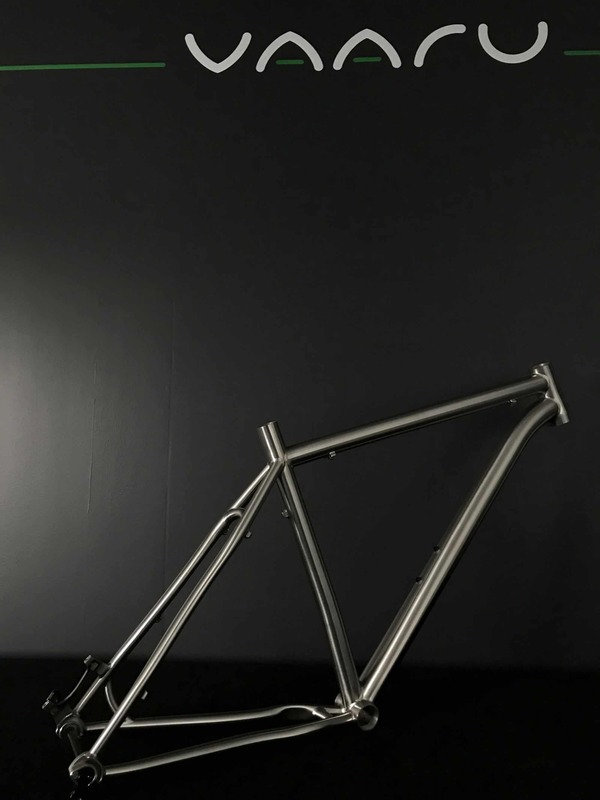 This frame is available as frame only on our website, please contact us if you would like to discuss having a full build. Reviewed by our customers below. 650B Frame Size Choose an option15.5"17.5"19"
I’ve been riding this bike for 2 weeks now and just returned from it’s first ‘proper’ test at Bike Park Wales, where it absolutely shone. The riding position is spot on and inspires confidence – it is poised and stable on the downhills and the lightweight frame makes it very manoeuvrable, you can chuck it into corners fast and come out smiling the other side. Not to mention the fact that it can sprint back up the hill in half the time! During our 5 hour epic it swallowed everything I threw at it, gliding effortlessly down the trails. A stunning bike with performance to match – it also attracted quite a bit of attention during our lunch stop! Rode the Switch 650 at the Hargroves QE Demo day. What a blast! Big grin. 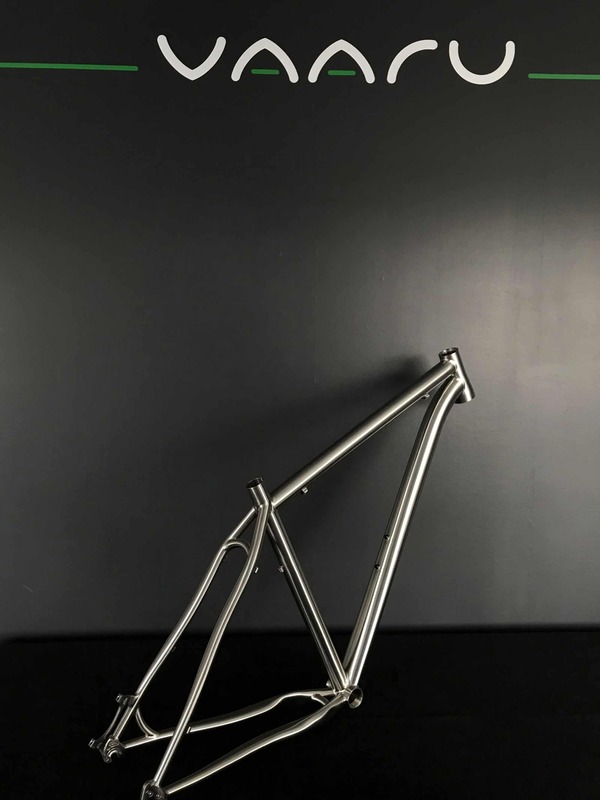 I ride a high-end steel singlespeed and I felt immediately at home with titanium. The frame is more compliant in the rear triangle than steel but in no way is it flexy, wonderful ride. If you are of the persuasion that you can have as much fun going up as you do going back down, then do try a Switch. 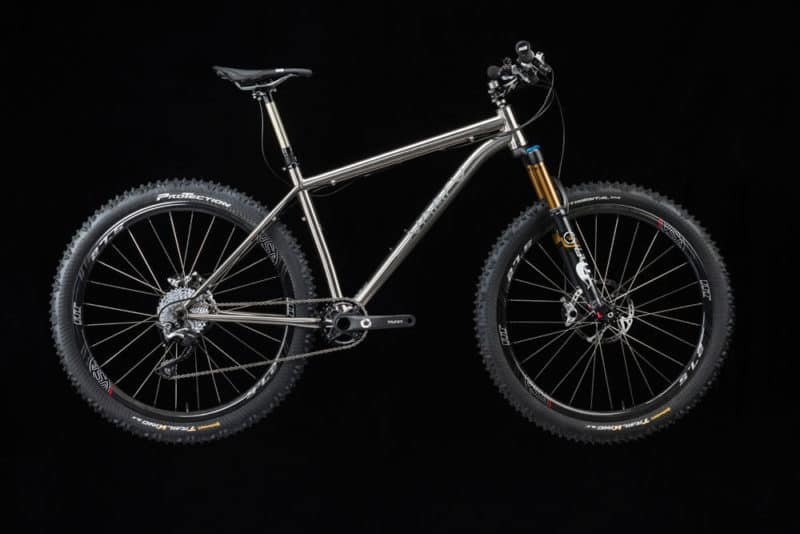 Even after riding 140mm and 160mm full sus bikes on the red trail, I still had more fun descending on this titanium hardtail. Smashed my best ever climbing times too. Never once felt I was fighting the bike or having to think about, it just became any extension of my thought processes. I would so love to own one, frame price is reasonable for such a handcrafted work of art. I bought the Switch 650b frameset from James and couldn’t be happier with it. Nearly all of my riding is at Afan Argoed as I live only 10 minutes ride from my house to my local trails. The trails at Afan offer a mix of riding from blue, red and black graded trails, the Switch is an ideal for this type of riding and takes it all in its stride. Modern geometry with a low and long position is fine for my riding, and I don’t feel the need for a full suspension frame. Has to be remembered that I’m still riding the hardtail at 62 years young. 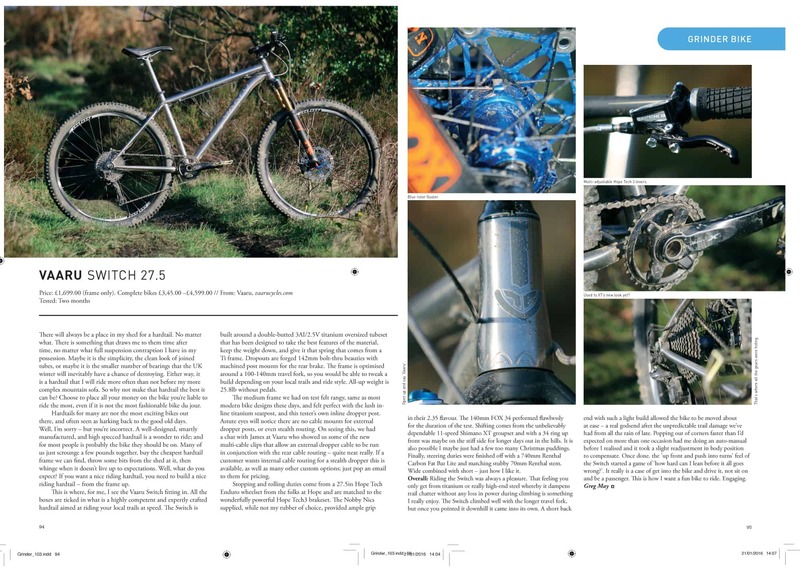 Whilst not being a full suss frame, the titanium frame is very forgiving and more than takes the trail buzz away. 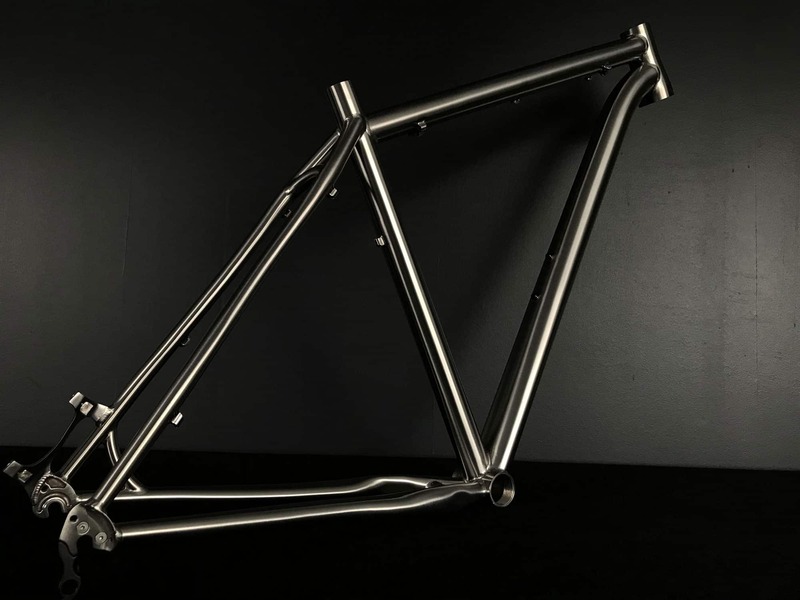 Quite simply, it is a joy to ride and the finish and welding of the frame is simply superb. Would buy another instantly, and I have had quite a few bikes in my many years of cycling, makes me smile when I open the garage door for another ride.